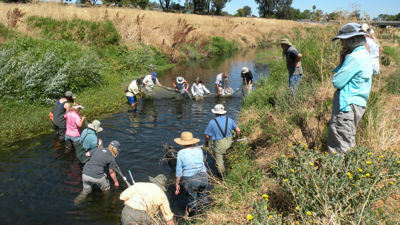 In August 2010 we began a new program – gathering data on the fish in Walnut Creek just below the drop structure near the Willows Shopping Center. This location is the farthest upstream that steelhead and salmon can come to spawn. We are attempting to document their success by sampling several times over the course of a year to see what species are present in the creek in each season. We returned to the area a couple of times in December to look for salmon. We found a few the first time, none the second. However, there were lots of signs of otters. In 2012 we sampled fish in Walnut Creek's Civic Park. We found a mixture of native and non-native species. We measured and identified each one in the trap before putting it back in the creek. 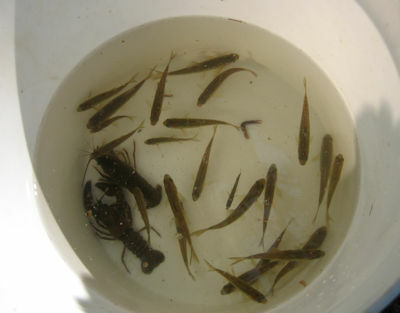 In addition to the fish, our traps caught crayfish. We took several samples over a period of six weeks and each time the size of the sample declined because the resident otters kept eating the fish. They moved on when the fish population got too low to be worthwhile. This is the balance of nature. Tice Creek was our sampling objective in the fall of 2017. We worked at two locations fairly close to each other and found all native fish but not a wide variety -- a lot of California roach and a single three-spined stickleback. There was more native vegetation on the creek channel than we expected, another happy surprise. Originally we had hoped to do fish sampling on a regular basis. Things have not worked out that way, but we do it when we can.